While online shopping makes it easier to see the great variety of plumbing fixtures available today, it can make it a bit hard for the average buyer to tell which models are rip-offs and which ones are worth your money. We found a few top-notch choices that we think you’ll love! We went out of our way to search for those that are made from superior materials, from brands with a high reputation for customer service and support. They’re durable, easy to install, and most importantly, they feel great to use! Below, you’ll find our top choices for the best options available now. We’ve provided in-depth reviews of each model. You’ll also find some selections for the best rain shower heads and the best handheld shower heads. Read on to find the one that’s right for you! A great shower can make the difference between a so-so day and a productive, inspired day. It’ll be refreshing, invigorating, and stress-free. Sadly, many shower heads just don’t cut it. They have few flow settings, annoying adjustment features, and they often develop leaks and sprays. If you’re used to an older shower head, you’re probably settling for a so-so shower. But you don’t have to! You want a shower without fiddly adjustments and frustrating flow patterns. A great product will cater to your preferences and have easy, simple adjustments to help it cater to everyone else in your house, too. The Enliven is our top recommendation for buyers on a budget. It’s built better than many other models in this price range, and is backed by a well-known company. It comes with multiple settings and will also save you money by reducing your water bill. There are three distinct spray settings. One is a wider, gentler spray, one is a focused massage setting, and the last is a middle range–basically a more intense version of the full spray. Reviewers said they’re well-thought-out, and easy to switch between. Reviewers said the Enliven is great for bridging the gap between older, less-efficient options which provide a fuller flow, and modern models which meet water regulations. The Enliven is limited to 2.5 GPM, which will comply with most state and federal regulations. However, buyers said it still feels like a surprising amount of pressure and flow. They said this is one of the best options for getting a high-flow feel with a low-flow efficiency level. The rubberized spray heads are easy to clean. They’re designed to resist mineral deposits, and wipe free of debris. The Enliven is more durable than other chrome models. 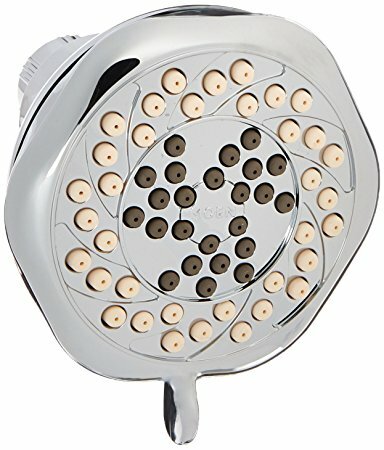 Most cheap showerheads have a bad reputation for quality. However, reviewers had no complaints about the longevity of the Enliven. The important parts are made of metal, and the plastic “chrome” parts are flake- and stain-resistant. It’s easy to install, and simple to maintain. Reviewers said they had no problems setting it up on their own. They also said that it’s extremely easy to switch between settings, thanks to the side lever. Some reviewers weren’t happy with the choice of spray settings. Their main complaint was that the wide “rain” setting was too weak. While it’s durable, it’s still made of plastic. Some reviewers thought it felt a bit cheap. And since the fittings are plastic, you’ll want to be careful when tightening them. The KOHLER Awaken (brushed nickel) is one of the least expensive options for a real metal head. At this price (and even beyond), many other models are made from faux-metal “chrome.” It’s a simple design with multiple spray settings and full flow power. Previous buyers said it performs and feels like a much more expensive fixture. The casing and joints are made from brushed nickel. It’s a lot sturdier than the coated plastic chrome casing, and it’ll resist spots and mold much better. The spray face is made from high-grade plastic, with silicone spray nozzles. There are three spray settings. A wide coverage option uses all the spray heads, while an intense drenching setting gives you higher pressure for rinsing soap and shampoo. There’s also a targeted spray setting, which KOHLER recommends for massaging sore muscles or cleaning the tub. Installation is simple and easy. Reviewers said it fits easily with existing setups. Most reviewers found that the Awaken produced a surprisingly strong spray. Reviewers with low pressure found that the low-flow design allowed for a more powerful stream, despite lower water usage. Reviewers said it’s very easy to keep clean. The spray face wipes clean of debris, and the nozzles bend to loosen mineral deposits as you wipe. Reviewers who bought the chrome model were disappointed in the lightness of the plastic construction. However, buyers who went with the nickel option complimented the sturdiness of the design. It’s more expensive, but buyers said it was worth the money. Several reviewers said that because of the rotating joint, you have to hold it still while changing settings. It doesn’t include a flange/neck joint. It’ll fit your current setup, or you can get a matching nickel setup for over double the showerhead’s price. The KOHLER Alteo is a good solution if you want a middle ground between a rain model and a traditional model. It uses aeration and special nozzles to focus and amplify water flow, while providing a wider spread of water. We also like that it’s very adjustable, so you can find exactly the position you prefer. Previous buyers said it’s one of the best all-around fixtures they had used. The Alteo is single-function. But it’s not just a rain option. KOHLER’s “Katalyst” spray uses aeration technology to boost flow, making this feel a lot more powerful than just a trickle. It’s really a fuller-bodied version of a normal spray. KOHLER’s MasterClean sprayface is easy to clean, and resists corrosion/buildup of mineral deposits. All you have to do is wipe the surface, and the nozzles will be clear. Buyers reported that they didn’t have any troubles with clogs or corrosion–even in homes with hard water. The nozzles are also designed to use water more effectively. They’re meant to minimize overspray and create a more focused experience. Reviewers complimented the sturdy metal construction, and said they felt much better owning a product that wasn’t cheap plastic. It’s easy to install. You won’t need a plumber, and many reviewers said they didn’t even need tape. It doesn’t include a flange/neck joint though KOHLER has a matching set for this one. However, most reviewers said the Alteo fit their current equipment without any major modifications. Some reviewers noted that the aeration produces more noise. It wasn’t a deal-breaker for them, but this one is certainly louder than a rain model. A couple buyers commented that their home water pressure didn’t give this one enough flow. They put the problem down to being on a well system instead of a water main. High Sierra is our favorite brand in plumbing right now! They’re not super well-known yet, but they’ve been impressing us and multitudes of buyers for the past few years. They make water-saving shower heads which feel as powerful as any full-flow models. Their best-selling model is a 1.5 GPM head, but we like this 1.8 GPM model a bit better for the average buyer. It still saves lots of water while giving you a bit more power and bigger drops. If you’re a water-conscious consumer, or simply trying to save on your utilities, these pieces are fantastic investments! It’s superb at boosting flow while saving water! High Sierra shower heads are different from other brands in that they have just one spray channel, instead of many little nodes. It gives you a consistent, full spray cone in a compact design. The reason we love it so much is it makes more efficient use of water than traditional spray faces. The cone design and special spray channel keeps water tightly controlled, so there’s less wasted on spray and splash around you. Instead, more drops are focused on you! So, you get more coverage and power per gallon. That’s the key reason why this feels just as powerful as full-flow fixtures! It’s an all-metal design. Every single part on this fixture from the fittings to the ball joint is made from solid metal–in the USA! We love the simple, elegant design. These fixtures last for years and years with no issues. They don’t even have to be cleaned, beyond a quick wipe-down. The powerful flow and single channel means there’s nowhere for mold to grow or sediment to build up. The High Sierra head practically blasts itself clean every time you switch it on! Because of its water consumption, this one also meets LEED certification standards, and is an official WaterSense recommendation of the EPA. It’ll save you nearly 1/3 of your water use compared to a standard 2.5 GPM fixture. It comes in a few different finish options. They’re all made entirely from metal, so this is a rare case where we can wholeheartedly recommend even the chrome model! It’s covered by a 2-year warranty and a 30-day satisfaction guarantee. Unlike so many of the big plumbing companies these days, High Sierra is also a fantastic company to do business with. They’re super helpful with troubleshooting issues you might run into, and they’ll even help you out with a custom-made shower head for no extra cost if the standard model doesn’t quite work for you. There aren’t any extra spray functions. There’s just on and off! If you like having lots of different patterns and options, look elsewhere. Some people might not like the look. Even with one of the fancier finishes, like the rubbed bronze, it’s fairly utilitarian. We like how small and unobtrusive it is, but if you have a lot of more ornate fixtures to match, this one might not fit in well. Hansgrohe is one of the trendiest brands in shower fittings. They’re a German company with a high reputation for design and build quality. The Raindance AIR is an aerated version of their best selling model. Previous buyers said it feels luxurious, powerful, and like a much less efficient fixture than it actually is. This uses aeration in a more refined way than many other models. Instead of amplifying the flow in a general way, the Raindance AIR has flow patterns designed specifically around the aeration. This reduces the stinging feeling you might have experienced with traditional aerated heads. Plus, there are 86 spray channels–more than other non-rain models. The general Rain Air setting provides a wide spray, like a rain shower head, but with amplified flow and volume. The Air Whirl setting concentrates flow in the center, with a pulsing, spiral-like effect. This creates a more intense jet of water, for massaging sore muscles or scrubbing stubborn dirt. Air Balance is an in-between setting, good for washing and rinsing. The nickel head combines a fully-metal outer casing with a high-grade plastic spray face. The nozzles are made from a rubberized material and designed to be clog-free, which will save you cleaning time. If you have a house with low water pressure, you’ll love this one. Reviewers especially liked that this model works even in houses with low water pressure. They said the aeration makes a huge difference. Customers who bought the chrome model reported a common manufacturing defect which caused leakages between the outer casing and the spray face. However, there doesn’t seem to be any issues with the nickel model. They also said that the customer service staff at Hansgrohe were extremely helpful, and quick to correct any issues. This model provides the coverage and experience of a rain model with the targeted rinsing abilities of traditional models. Previous buyers loved that it balances a great aesthetic with engineered power in the flow channels. It’s made from metal parts and is guaranteed for life. We’ve recommended the brushed nickel version, but it’s also available in antique bronze or oil rubbed bronze. Even with a wide spray head and powerful flow, it’s designed to meet most water regulations. The Velocity is limited to 2.5 GPM, and there’s also a 2.0 GPM model available for buyers who live in more restrictive areas. There are two spray settings. The first is an even “rain shower” effect, and the second is a more focused, intense spray. The Velocity uses a full 8” spray head with 100 spray channels. Both settings use Moen’s self-pressurizing flow technology. This is a modified channel design which uses spokes branching out from the center to create greater pressure in the shower head itself. The result is 3x the pressure while you shower, with more even spread than other rain options. Unlike aeration, it’s quieter and doesn’t feel as aggressive on the skin, so if you like a gentler spray, you will like this one. There’s also a lot less heat loss. The construction is all-metal (while there’s a chrome version available, we’d recommend opting for a real metal casing, either the nickel or a bronze option). This model uses Moen’s LifeShine finish, which is guaranteed not to tarnish, fade, or corrode over time. The spray heads are made of rubber, and clean easily. You just wipe across with a cloth, and any sediment comes away. They’re designed (and guaranteed) to be clog-free. There’s a lifetime guarantee on this one, and reviewers praised the customer service at Moen. One reviewer wrote that she had questions during installation, and her call was answered helpfully and courteously. It’s expensive. However, you’ll never have to buy another one. It’s heavy. At nearly 4 pounds, you’ll want to make sure you’ll have appropriate flange arms and brackets to hold this one in place. Choosing one of these shower heads will greatly enhance your shower experience. So, which one should you install in your home? The Moen Enliven is the obvious choice for people on a very tight budget. It’s easily the cheapest fixture we’ve recommended, but it performs significantly better than other entry-level options. We think this is the least you can pay for a “real” showerhead with strong flow, and a reliable build. With all that said, it feels pretty cheap, and it won’t last as long as any of our all-metal recommendations. The Kohler Awaken is the least expensive all-metal fixture here. It’s a good choice for people who would rather spend a bit more up front and get something that’s going to last longer than a chrome finish/plastic construction. It has several settings to choose from, and it both looks and feels more expensive than it actually is. On the downside, it’s a bit awkward to use, especially when you want to adjust the settings. This one also doesn’t give you quite as much coverage as our more expensive recommendations. The Kohler Alteo is a good compromise for people who want the luxurious coverage of a rain-can model without the high pricetag. It also helps with low water flow, since the Alteo actively aerates your supply to make it feel more powerful. We think it’s the best of the budget range, even thought it’s not quite the cheapest. An ideal fixture for your second bathroom. The High Sierra may not be the most elegant fixture here by most standards, but it’s one of our all-time favorites for good reasons. This one is powerful, simple, and reliable. However, the best part is the low water usage. It saves lots of water, but it still feels as powerful as any item in this guide! It’s our top recommendation for people who want a full shower experience without wasting water or money. It’s a smart investment at the checkout, especially since it will save you on utility bills. We recommend this one to people who care about quality, but aren’t concerned with lots of fancy features or settings. It’s impressive without trying hard to make a statement. The Hansgrohe Raindance is a great choice for trendy people, and those who like lots of different flow options. And thanks to its very effective aeration system, it’s a good luxurious option for people dealing with lacklustre water pressure. However, it’s not quite as reliable as the Moen Velocity. The Moen Velocity is our ultimate choice for the best of all worlds. It has the coverage of a rain-can unit with extra power and versatility that put it above the Hansgrohe in our estimations. Plus, this one has a much better track record over the long term. While the price means it may not be the first fixture you ever buy, its quality and performance will likely make it your last! This 8” model from KES is our least expensive choice for an all-metal rain shower head. At 8”, it’s wide enough to give you solid coverage without being obtrusive. The spray heads are clog-resistant rubber, and wipe clean. The stainless steel construction is light and low-maintenance. It comes with all the hardware you need, and even the fittings are stainless steel. Reviewers loved the strong flow and even spread of water. Our top recommendation for a handheld shower is the Universal Slide system from Delta. It’s a complete set with a height-adjustable wall bar. There are 7 different spray settings, enough to keep everyone in your household happy. Reviewers loved its adaptive flow and range of motion. The all-metal stainless steel construction is durable and easy to maintain. It’s all covered with a lifetime warranty. Our best-selling recommendation for low-flow options comes from High Sierra. With a flow rate of 1.5 GPM, it exceeds all federal standards for water usage, including WaterSense and LEED certifications. How does it work? High Sierra has integrated a special flow system with a cone restrictor. It minimizes overspray and pushes all the water into a specific spray zone. Reviewers praised its strong flow and powerful coverage in spite of its low water usage. Best of all, the head and fittings are built in the USA from brass and ABS plastic. This Delta model uses modified flow channels to consolidate water into one dense stream. It’s equipped with Delta’s H2O Kinetic system, which forms droplets into waves–creating the sensation of a fuller, more intense flow. A side valve switches the flow rate between 1.5 and 2.0 GPM, so you can choose how much pressure you want. Reviewers said it was a quick, cheap, yet attractive fix for their water pressure issues. Read our top picks for top High Pressure Shower Heads. Think about your ideal shower. Do you like a gentle, relaxing flow pattern? Or are you someone who likes a strong, intense shower? Do you like multiple settings for washing and rinsing, or a single function? Depending on your household, you might have preferences that are different from those of your family or roommates. Multiple-setting heads let you adjust between flow patterns to suit different tastes, making these perfect if you live with multiple people. Narrowing down your preferences will help you decide which type is best for you. Traditional models tend to be fairly adjustable. They’ll have intense settings and gentler spray options. Most have 3 to 5 spray patterns, which should be enough to cover everyone in your household. Rain shower heads provide the widest, gentlest flow. They’re relaxing, even, and don’t have the temperature loss problems of some aerated versions. Some models include the option for a more intense flow, but rain models are generally not as focused or controlled as other heads. Handhelds are the most flexible option, and you’ll be able to use them for washing and rinsing all over your body. You’ll have the option of mounting these overhead, and returning the unit to a bracket, or using a handheld head in conjunction with another shower head. They’re very convenient for washing pets, cleaning the tub, and making bathing easier for children and elderly people. You’ll want to consider your home’s water pressure. Most shower heads will perform well under moderate to high pressure. However, some don’t work as well as they should when run off wells or springs. Some use aeration (air injection) to compensate for lower pressure. Generally, rain versions don’t work so well in houses with low-flow. Be on the lookout for special pressurizing technologies, which can help compensate for low-flow systems. It’s also a good idea to take your bathroom into consideration. You don’t want to spend time shopping for the perfect product only to find that it doesn’t fit. Make sure you get measurements for your current shower fittings, so you’ll know whether you’ll need new brackets or flanges when you buy your new shower head. The angle of your shower head will also influence your shopping decision. You’ll want to accommodate for height, too, keeping in mind all the members of your household. Depending on where you live, you’ll need to comply with various water use regulations. All of our choices comply with a 2.5 GPM (gallons per minute) flow rate, which is the standard for most states and territories. However, you’ll want to check and see what the law is in your area. Many states are considering restricting rates even further, and some have already moved to a 2 GPM rate. We’ve made sure to provide a few options for you if you live in one of those areas. Many newer products are made from plastic materials. This saves weight and cuts costs. While some plastics are high-grade and can be used to supplement metal parts, we found that most plastic models simply don’t hold up to regular use. Many plastic fittings crack under tightening, and we’ve read countless reviews from buyers whose shower heads cracked, split, clogged, or leaked within weeks or months of purchase. When you’re looking at construction, look for ABS plastics, or other engineering-grade materials. These hold up to heat and water much better. And remember that while they cost more, metal heads are always the best option for durability. Be wary of shower heads which are described as “chrome” material. This usually means that the material is plastic. It’s either painted to look like metal, or coated with a very thin layer of metal on the outside. Reviewers found that many of these models flaked, peeled, or developed mold spots. We’ve gone out of our way to find shower heads made from metal and engineering-grade plastic parts. And you won’t have to pay too much more for significantly better quality. We chose our options to fit a broad price scale. While some of the full-metal options might seem expensive, it’s worth keeping in mind that some big brand “chrome” heads run even more expensive–and are significantly less durable. Check out our comprehensive reviews and rankings for different shower heads!